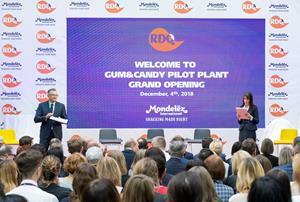 Mondelēz International Expands its Global Technical Center in Wroclaw, Poland | Mondelēz International, Inc.
WROCLAW, Poland, Dec. 04, 2018 (GLOBE NEWSWIRE) -- Today, Mondelēz International announced a new investment in its Global Technical Center in Wroclaw, Poland. Only 1.5 years after the center opening, the company invested a further $5 million, in addition to the initial $17 million investment, to expand the research and development activities beyond Chocolate and Bakery and serve Gum and Candy innovation. This state-of-the-art facility will now serve as a R&D Hub for a wide range of the company’s iconic global and local brands under one roof, in Biscuits (Oreo, belVita,) as well as Chocolate (Milka, Cadbury Dairy Milk, Toblerone) and now also in Gum and Candy (Trident, Hollywood, Stimorol and Dirol), offering a fantastic scope of creativity. This expansion is part of the company’s previously announced $65 million investment in large RDQ hubs, strategically positioned around the globe. These centers enable Mondelēz International to better recruit, retain and develop talent across a range of science and technical disciplines while accelerating the company’s growth and innovation. In addition to Wroclaw, Mondel?z International has ten other Technical Centers already in operation around the world, including East Hanover, New Jersey, in the United States; Curitiba in Brazil; Bournville and Reading, both in the UK; Thane in India; Singapore; Suzhou in China; Saclay in France; and Munich in Germany.